I have written before about Ag. Metamorphosis near Asine -- here and here. 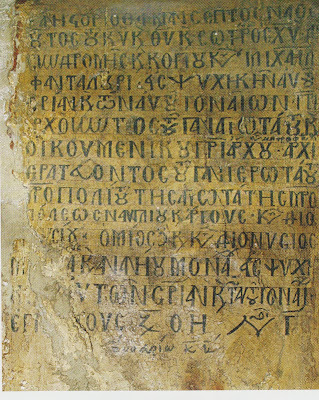 I am writing again because I want to call attention to Micheli Fantalouris -- that is his name in the third and fourth lines of the inscription in the church. This is the way the inscription looked when I first saw it in the 70s. Now some idiot has installed a glaring electric light in the lower part of it. Michelis Fantalouris was a member of one of the very few Greek land-holding families that we know of from the Venetian occupation, and the only one where we actually know the precise piece of land -- the land which surrounds Ag. Metamorphosis. The family was involved in trade and owned a ship. (There is a reference for the family in footnote 43 here.) Probably not a very large ship. Down the hill from the church is a hidden cove, barely large enough for a grippo or a light galley. 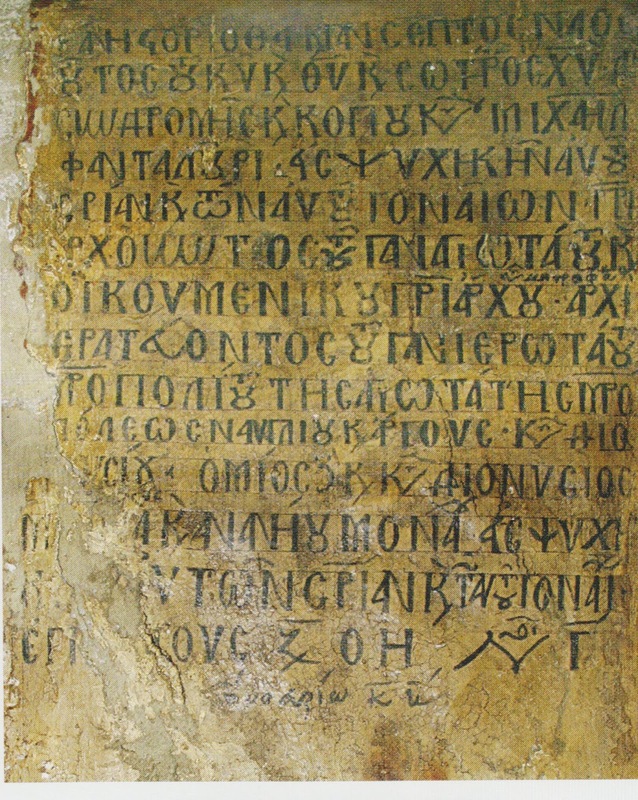 The inscription asks us to pray for the souls of Michelis Fantalouris and his children, and is dated 1570, thirty years into the Turkish occupation. I make the final bit of the inscription November 28, which would make this November 1569 in our calendar system. 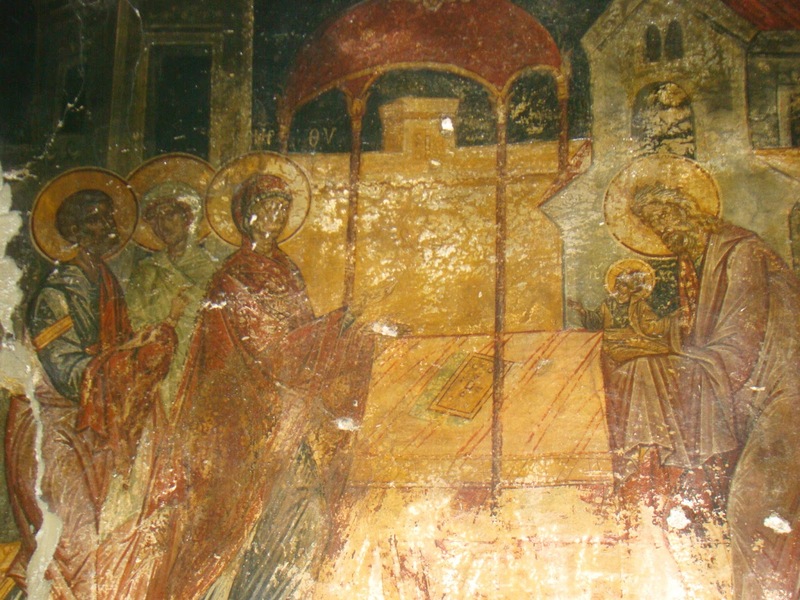 No matter, Micheli paid for the little church to be frescoed again. Here are a couple of the 1569/70 frescos. Several of them have been varnished over and photograph poorly. The painter was very fond of diagonal lines. This bit of fresco, though is different. 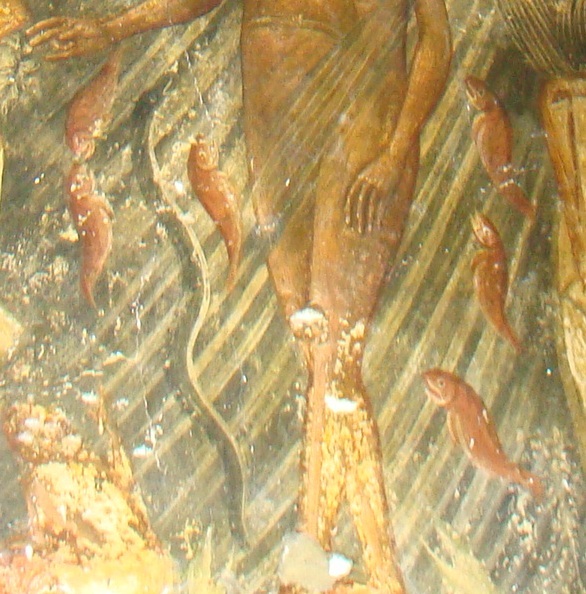 Here the painter has preserved some of the previous fresco -- from about 1400. This is at the top right, as soon as you enter the church. This detail shows a group of Westerners, Latins -- there is a small child at the left edge -- following the direction of a young man to look at the crucifix appearing in the sky. It seems to have been painted by a Greek, but the image is more Western. I think it is of Franciscan influence, and have tried to get opinions on this, but without any luck. 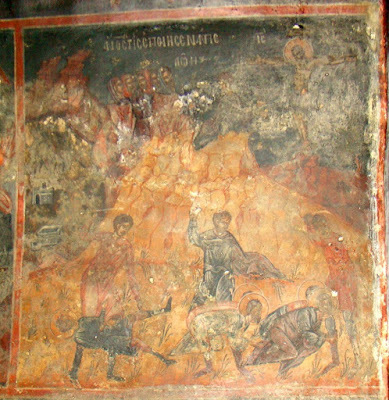 It is one of the very very few -- about four -- Western frescos I have found surviving in the Argolid. I would be so pleased to be proved wrong and shown that there are more. In 1569/70 Michelis Fantalouris was an older man. What is most remarkable is that he did not live in Nauplion, or out near Ag. Metamorphosis, but in Venice. My friend Ersie Burke* has found him listed in the register for the scuole of S. Giorgio dei Greci in 1575. It appears that he continued his trading in Venice, was considered a worthy member of the Greek community, and so that he sent money back to Nauplion to have his family chapel refrescoed. From this entry in the scuole membership book, it looks as if Michelis died in 1579. That is all there is to say about Michelis. Sathas, V. 8, 363-64, mentions the brothers Cosmas and Nicolò Fantalouris, and a woman, Cali,being provided Venetian jobs in 1542, but we don't know their relationship to Michelis. We don't know when Michelis went to Venice. Pray for the soul of Michelis Fantalouris. Ersie Burke has an important book coming out soon from Brepols -- The Greeks of Venice, 1498-1600: Immigration, Settlement, and Integration.